So fire is not necessarily the enemy–unless you’re a human with a house full of stuff in its path. Plants and animals depend on fire to clear the forest floor of competing undergrowth, to maintain old growth, to replenish the soil with nutrients, to create new habitat, to stimulate biodiversity, to release the seeds of fire-dependent species and more. One wonders, though, given the effects of climate change–longer fire seasons and larger, more intense fires–will animals who must move on to new homes find enough available habitat? When wildfire comes calling, all priorities shift. Animal rights work slides into oblivion while concern for individual animals–in this case, our own companion animals–sets sirens to shrieking in my head. Can I sneak the two cat carriers out of the attic undetected? Will I be able to catch Larkspur, our frightened, half-feral girl, when I absolutely must? (The element of surprise is critical!) Is her thyroid medication packed? Will the kennel have room for our dog Winter?…and when will I make the 25 mile round trip? Arrrgh!!! Two small, lightning-sparked fires detected on Sunday, August 18th merged and exploded into the Lolo Creek Complex fire on Monday. Evacuation wasn’t immediately ordered, but still, we had to be ready to go and spent a fairly frantic day deciding what absolutely couldn’t be lost, packing it up, and getting it out of Dodge (thanks, Ken & Niccole!). By Monday evening, evacuation in our neighborhood was voluntary; we decided to stay. To ensure Winter’s safety (and spare her the upheaval and anxiety), I made an early evening run to the kennel spurred on by the immense, menacing smoke column looming above our northern Bitterroot Valley home in the foothills. Tuesday brought choking smoke and hurried consultations about what additional stuff to pack in which car. Suddenly, I remembered a critical item still in the attic. “Oh my god,” I gasped to my husband, “Walden’s ashes! Her ashes have to be mingled with mine!” We processed this idea for a moment–that ashes had to be saved from a fire–then burst into peals of tension-breaking laughter, even while understanding the significance of that one animal companion (in this case, a blue-eyed Aussie-cross) who comes along once in a lifetime. That evening we got the word: It’s time to go. The fire had made another explosive run and was bearing down on our rural neighborhood. Nothing gets the lead out like hearing, “You might have two hours, you might have 20 minutes.” Larkspur was successfully nabbed mid-nap. Juniper proved to be the tougher customer, resisting the carrier with six or eight legs while making noises I last heard in “The Exorcist.” We loaded them in one car–the other being partly filled with bags and cans of premium dog and cat food–and made a run for it. But wait–we forgot Winter’s orthopedic bed! It wasn’t too late to dash back and grab it. Evacuation, it seemed, was largely about our animal companions. Even the dead ones! We spent the Tuesday-to-Saturday evacuation with friends (thanks, April & Steve!) whose detached, one-room cabin allowed us to be with our kitties while all four of us–cats and humans–freaked out, each according to her or his own species. …We patronize them for their incompleteness, for their tragic fate of having taken form so far below ourselves. And therein we err, and greatly err. For the animal shall not be measured by man. In a world older and more complete than ours they move finished and complete, gifted with extensions of the senses we have lost or never attained, living by voices we shall never hear. Indeed, some animals owe much to wildfire. 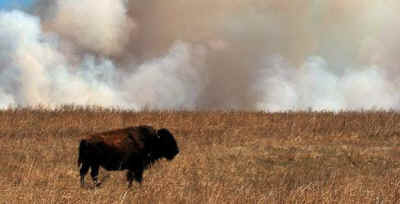 The American bison evolved with the prairie biome; fast-moving grassfires shaped both land and animal. Flames made the lumbering bison fleet of foot, able to outrun a fire at 30 miles per hour. Certainly this means that slower animals were overtaken and perished, but natural selection is nature’s plan. 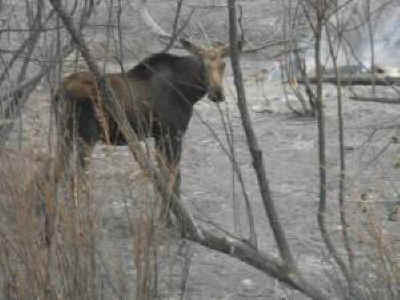 After all, even my own home sits in a rural gulch that was, decades ago, available habitat. And even though we’ve made every attempt to maintain a native landscape and a presence as unobtrusive as possible, we’re surrounded by barking dogs, droning lawnmowers, ATVs, and other intrusions entirely heedless of human neighbors, let alone consideration for wildlife. The elk who used to look in our windows moved on years ago. 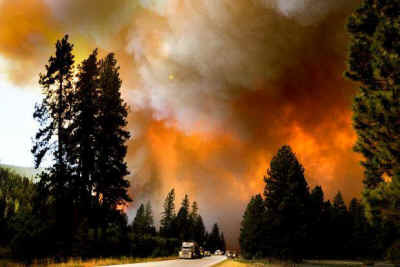 The Lolo Creek Complex fire was, for one critical day, the nation’s number one priority fire as it came barreling down the Lolo Creek canyon, consuming five homes on its way. The assembled team of hundreds–firefighters, National Guard, agency personnel–from around the country and Canada stopped the fire just short of our neighborhood, teaching us humans an unforgettable lesson in gratitude. Our household is back to normal. The cat carriers are stowed in the attic near the ashes of three beloved cats and one dog. Out in the charred forest, wild animals pursue their lives as they have for millennia.